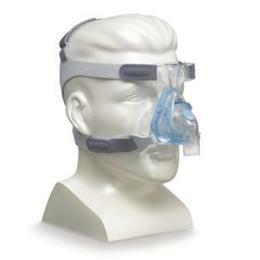 Small EasyLife Nasal Face Mask with Headgear Duo Pack. Duo Pack includes headgear and two cushion sets of the same size. (A cushion set includes one inner seal cushion and one outer support cushion). Seal - Our unique inner seal cushion moves with the patient to automatically extend over the nasal area and instantly create an effective, self-adjusting seal. Support - Our outer support cushion allows the mask to rest lightly and comfortably against the face. The cushion’s built-in forehead pad adjusts automatically, eliminating a traditional fitting step. Intuitive - Combined, the Auto Seal features make EasyLife our most intuitive mask. One that is easy to fit and easy to use, requiring minimal adjustments.